At the amusement parks or funfairs, bumper cars are popular from long ago. Bumper car is a highly mobile amusement rides. 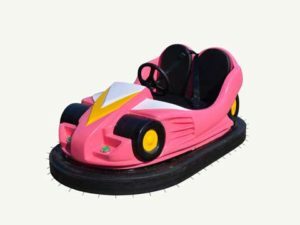 With the technological innovation, increasing performance, more and more types of bumper cars has been manufactured by large amusement rides manufacturers. Beston Amusement, as a large amusement rides manufacturer, has exported many sets of bumper cars to Australia. Here we will introduce the working tips for different types of bumper cars that we had exported to Australia. 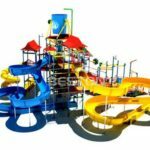 Mainly including the battery bumper cars and electric bumper cars (floor grid bumper cars and ceiling grid bumper cars). How do Battery Bumper Cars Work? Battery bumper cars has better adaptability than the electric bumper cars. Each set of bumper car are powered by two group batteries. 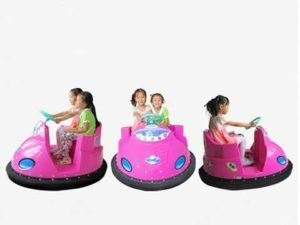 Battery bumper cars can works on different kinds of floor, this is different from the electric bumper cars. Battery bumper cars are free to use in different areas, even concrete and ice ground. But electric bumper cars should be used on the specific floor. Battery and the motor will provide the power and then to drive the wheel to run. Set up of ceiling grid bumper car need to install Skynet and ground network. Electric equipment need 380 powers. The control cabinet transformer voltage regulator to meet the ceiling grid bumper car’s running voltage. Two electrodes of the power supply are respectively arranged on the ceiling grid and the floor grids. The power will be supplied to the electrode through the power and then to guide the bumper car bodies. 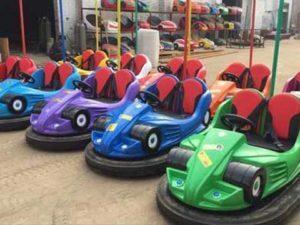 The ground grid bumper cars need to install ground grid, because two electrodes of the ground grid bumper cars need to be set on the ground network, specifications of the ground grid bumper cars should be separate. Between each pieces of floor, there should be paved the insulation layer. There are two contact points that were connected to different electrodes of the two ground grid and then supply power to the motor. This is how bumper cars work, hope this post will help you.